Prime Minister Peter O’Neill cut his teeth in real-estate. It ended in a slew of damning findings that consumed the better part of two Commission of Inquiries. His right hand man during this period was Oscar Wandi Yamuna, allegedly O’Neill’s first cousin. In addition to acting as Director at Pangia Enterprises – one of the thoroughbreds in the O’Neill real-estate stable – Yamuna was accused of having abused his position as head of the Investment Corporation of PNG, in order to award a series of illicit contracts to another real-estate firm, alleged to be beneficially owned by O’Neill. Now Yamuna is the Prime Minister’s deputy Chief of Staff, and alleged enforcer. The veracity of Morauta’s claims cannot be verified, but they were widely reported at the time and with no apparent statement of rebuttal from Mr Yamuna. It now appears that a man who once drew the ire of Justice Sawong for his role in a series of alleged property frauds, is now entering his old stomping ground, this time through the giant K800 million Gabutu Palace waterfront development near Port Moresby. The massive public-private joint venture project, involves the shadowy National Housing Estates Limited, and Korean businessman, Chul Jeong. National Housing Estate Limited raised eyebrows around the country, after it took over a range of duties, and properties, from the National Housing Corporation. Since then its performance has been marked by a notable lack of transparency, Companies Act violations, and a growing mass of civil court litigation. In this PNGi investigation, we will examine how Oscar Yamuna obtained a lucrative stake in one of the country’s biggest public-private real-estate ventures, for what appears a modest entry price. As PNGi previously detailed the connection between Oscar Wandi Yamuna and Peter O’Neill, first came to prominence in two Commission of Inquiries: the well publicised, Commission of inquiry into the National Provident Fund and the more recent Commission of Inquiry into the Investment Corporation of Papua New Guinea (ICPNG). Yamuna was the short-lived managing director of ICPNG from 1998 to 1999. His tenure was cut short following an internal investigation which led to Yamuna’s suspension. In its final report the Commission on Inquiry, headed by Justice Don Sawong, recalled the findings made against Yamuna by the 1999 internal investigation. These included findings of misappropriation, collusion, unlawful engagement of legal practitioners, sales agents and companies, illegal sales and contracts, failure to protect the interests of the Corporation, misappropriation of various sums totaling over K6 million, diversion of funds against board resolutions and the fabrication of Board minutes. Justice Sawong found that eight years later, no action had been taken against Yamuna on any of the findings. No media or court record could be found, documenting what, if any, attempt was made to prosecute Yamuna. Sawong, D. (2007) Report of the Commission of Inquiry into the Management of the Investment Corporation of Papua New Guinea and the Investment Corporation Fund of Papua New Guinea and all matters relating to the Conversion of the Investment Corporation Fund of Papua New Guinea to Pacific Balanced Fund, pp 223-225. The Gabutu Palace real estate development is one of a number of colossal public investment projects announced by the national government in the lead up to the APEC 2018 leaders summit in Port Moresby. A public-private joint venture, Korea Nuigini Housing Limited, is the owner. 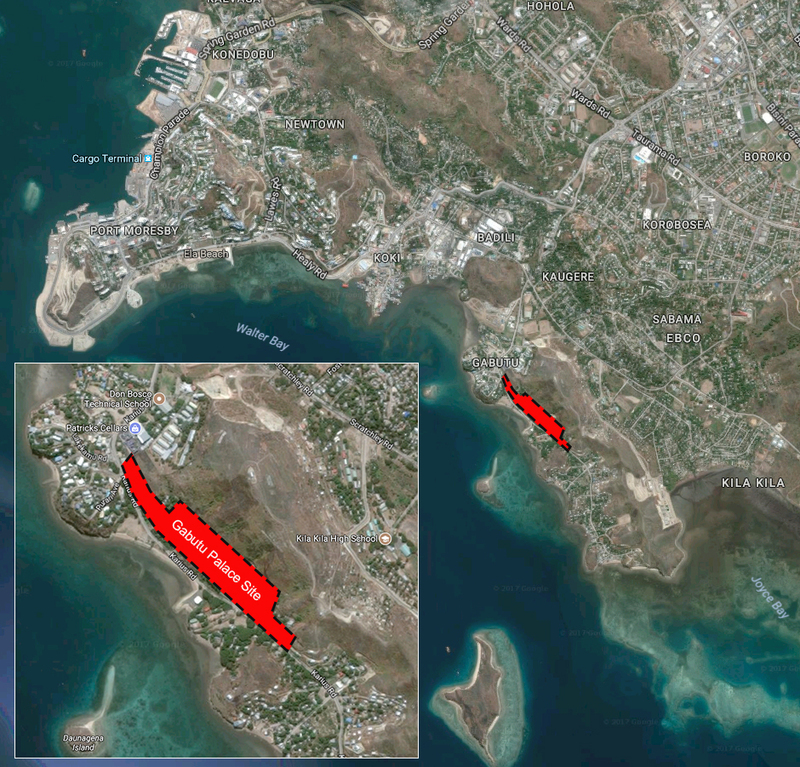 It was initially claimed Gabutu Palace will comprise one thousand new apartments in ten 15 storey blocks, and a new shopping mall, all on a picturesque beachfront with views over the ocean and downtown Port Moresby. However, two years after its public launch, there is no sign yet of any building work at the site and the promised completion date of 2018 seems very unlikely. The project’s architect is the Korean firm, Samoo Architects & Engineers, a subsidiary of Samsung C&T Corporation. It is to be financed by the Korean Hana Financial Group. Government officials have suggested the starting price for apartments, once completed, will be K700,000 each. It would seem this is yet another development targeting PNG’s elite, and wealthy expatriates, rather than affordable accommodation in a city stricken by an ever-increasing housing crisis. Gabutu Palace is being developed through a public-private partnership by the joint venture company Korea Niugini Housing Limited (KNHL). At the beginning of 2017, the company’s board valued its assets at K28.2 million. 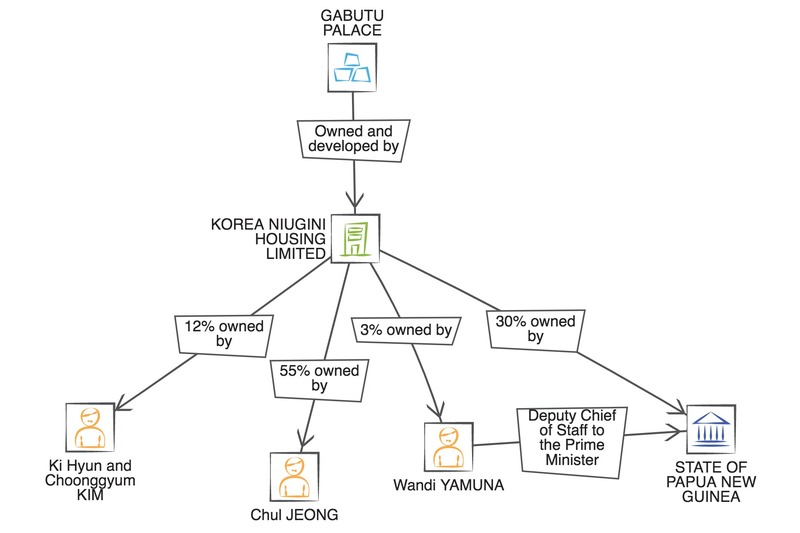 The Gabutu Palace project developer, Korea Nuigini Housing Limited, is a PNG registered company incorporated in April 2015. Initially, Korea Palace Construction Limited owned 60% of the shares, and National Housing Estates Limited (NHEL) owned 40%. 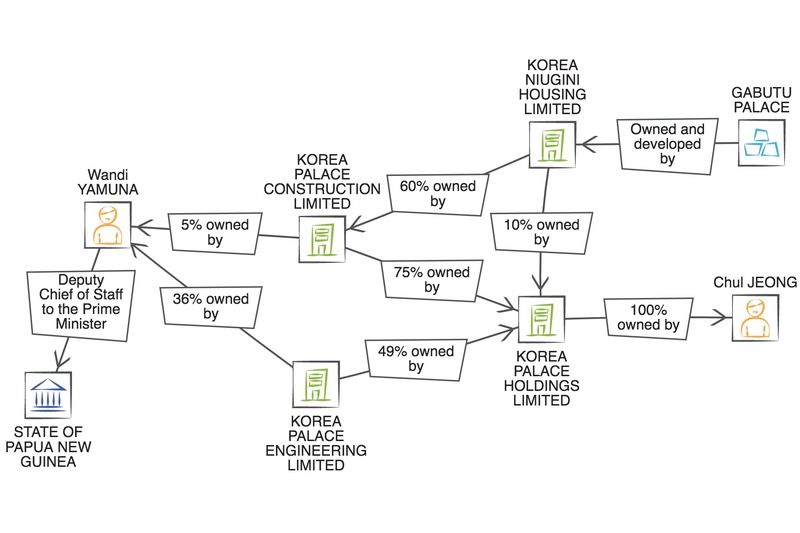 Korea Palace Construction Limited was, at that time, 100% owned by the Korean businessman, Chul Jeong. So effectively he owned 60% of Korea Nuigini Housing Limited and thus 60% of the Gabutu project. Since then, two significant changes have been made in the ownership of Korea Nuigini Housing Limited, one directly and one indirectly. The first significant change occurred on 28 July 2016, at a peculiar Board meeting convened by Korea Palace Construction Limited. At that meeting was the company’s sole shareholder and only director, Chul Jeong, company manager, Young Ha Choi, and Wandi Yamuna, who has been the Deputy Chief of Staff for the Prime Minister since at least September 2014. The Board meeting lasted just 12 minutes but made two significant decisions. In the first agenda item it was resolved that Wandi Yamuna be appointed a director and in the second that all the shares in Korea Palace Construction would be relinquished by Mr Jeong and redistributed, 5% to Yamuna himself and 95% to another company, Korea Palace Holdings Limited. An examination of the IPA records for Korea Palace Holdings Limited reveals this company is itself owned by Chul Jeong; so in transferring 95% of his shares in Korea Palace Construction to Korea Palace Holdings, Jeong was effectively transferring them to himself. The Board meeting minutes describe the change in shareholdings as a ‘redistribution’. No mention of payment or other financial compensation is made. However, a subsequent notice of the share transfer lodged with the IPA suggests K50,000 and K950,000 in cash may have been paid by Yamuna and Korea Palace Holdings Limited respectively for their shares. Given that this is proclaimed to be an almost K1 billion project, Yamuna’s decision to pay this modest entry price, would appear a prudent one. The second significant change in the ownership of Korea Nuigini Housing Limited occurred in April 2017 when the National Housing Estates Limited (NHEL) reduced its shareholding from 40% to 30%. It did so by transferring 25% of its 40% shareholding to Chul Jeong, via his company Korea Palace Holding Limited. 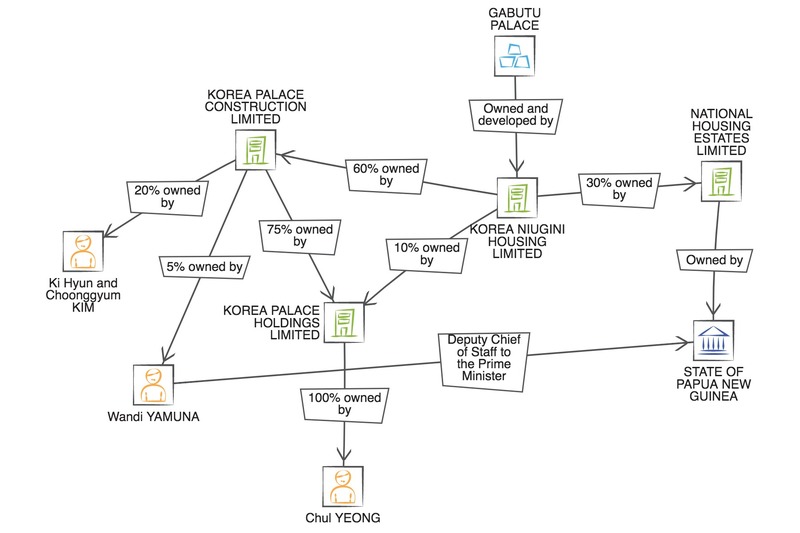 The upshot of these changes is that Gabutu Palace has changed from a 60/40 joint venture between the government and Chul Jeong to a project in which the State has a 30% interest, Jeong 55%, Wandi Yamuna, 3% and, since June 2017, Ki Hyun and Choonggyum Kim 12%. In 2017, the Deputy Chief of Staff to the Prime Minister, obtained a stake – for a nominal fee – in another company enmeshed in the corporate web connected to the Gabutu Palace project. This took place through the company, Korea Palace Engineering Limited. Originally, Korea Palace Engineering Limited was owned 100% by Korea Palace Holdings Limited which, as we have seen, is 100% owned by Chul Yeong. But, in February this year, Chul Jeong decided to transfer 36% of the shares in Korea Palace Engineering to Wandi Yamuna, and another 15% to a Ms. Unice Toira, another PNG national. The decision was recorded in the minutes of a Board meeting held on 7 February. According to documents filed with the IPA, Yamuna and Toira each paid a nominal K1 for their respective 36% and 15% stakes in KPEL. It is not known how much this ‘gift’ is really worth. In its most recent Annual Return, Korea Palace Engineering claims it has assets and liabilities of K10,000, in effect giving the company nil value. However, we can’t discount that Korea Palace Engineering may be party to private contractual agreements, which would give the company greater prospective value. At a second board meeting for Korea Palace Engineering, held 6 days later, on February 13, it was resolved to appoint Yamuna a director of the company. On January 1, 2017, the Board of Directors of Korea Nuigini Housing Limited met in Port Moresby. It was an unusual meeting. Not only was it being held on a public holiday, New Years Day, it was the first formally documented Board meeting for almost 12 months (the Board had last met on 16 January 2016), and it was a meeting called at short notice. Five people were present, Kevin Ming Ahipum, Executive Chairman of NHEL, Yoonsung Lee, Chairman of Korea Palace Construction Limited, Chul Jeong, CEO, Michael Barobe and Jinwook Kim. At the meeting the Board unanimously agreed to appoint Wandi Yamuna as a director. But the question is, whose interests does he represent on the Board? Is he there to represent his current employer, the State? Or is he there to represent the interests of Korea Palace Construction, the company in which he is a shareholder and director? In many instances the interests of the two may coincide, but sometimes they won’t. The State has many more interests and obligations than just the maximization of profits; it must ensure the interests of all its citizens and the environment are protected. How will Yamuna vote on issues like providing affordable housing, environmental safeguards and forced evictions, especially when those conflict with the maximization of financial returns? We should also ask why, more than eight months after the Board meeting appointing Wandi Yamuna to the Board, have the IPA public records not been updated to show the appointment? Especially since other decisions made at the same board meeting relating to the share ownership have been notified to the IPA. Increase in share issue and allocation of the new shares notified to the IPA in a Notice dated 8 February 2017, accessed via the IPA website 12 September 2017. As we have already noted, although at its launch in 2015 the Gabutu Palace project was slated for completion ahead of the APEC leaders summit in Port Moresby in 2018, two years on there are no signs of construction work at the site. It is not clear what is causing the delay in construction. However, PNGi has found court records documenting a long running ownership dispute over land described as Section 81, Allotment 26, Matigoro. In 2015 the State, through the Department of Lands, granted business and residential leases over this land to National Housing Estates Limited and Korea Nuigini Housing Limited. However, the National Court, in May 2017, ruled those leases ‘unlawful, void abinitio and quashed’ as they had been granted only after the Registrar of Titles had ‘unilaterally’ cancelled a pre-existing title over the same land. This, according to the courts was done ‘incorrectly and unlawfully’ in breach of Sections 160 and 161 of the Lands Registration Act. Both NHEL and KNHL have been ordered to deliver their copies of the State Lease for cancellation. It is not clear if this land is connected to the Gabutu Palace venture. If it is, this may explain the notable delays. This PNGi investigation has not alleged that Oscar Yamuna is involved in illegal conduct. But clearly revelations that the Prime Minister’s long-standing right hand man – an individual heavily censured by the ICPNG Commission of Inquiry – now enjoys a beneficial interest in a major property development, that is part-owned by the Government through a shadowy private vehicle, is not welcomed news for a public crying out for affordable housing. It is not clear what, if any steps have been taken to manage the potential conflict of interest between Yamuna’s role as Deputy Chief of Staff to the PM, and his private stake in this joint venture involving another arm of government. Given that real-estate development has been a potent sphere for corruption and other illegal activities, the PNG public deserve a full explanation of what actions have been taken to ensure this potential conflict of interest is being managed in a transparent and accountable fashion. A full account is especially warranted in light of the serious issues raised by Justice Sawong in his inquiry into ICPNG, which focused on a period when Yamuna was Managing Director, and allegedly making illegal decisions to the benefit of his cousin, Peter O’Neill.